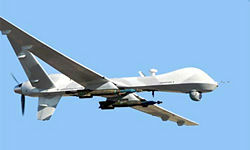 Developed by the United States, and operated by the U.S. Air Force, U.K., Italy, Turkey, the UK and the US Border Patrol, the MQ-9 Reaper is medium-to-high altitude, long endurance unmanned aerial vehicle. It is a larger descendant of the MQ-1 Predator, but can be taken apart, put into shipping containers, and carried by a C-130 Hercules or larger aircraft. The drone aircraft can be used both as an intelligence, surveillance and reconnaissance (ISR) platform as well as a "hunter-killer" for armed reconnaissance. The Royal Air Force tends to emphasize the former and the USAF the latter, but the same aircraft does both. Since October 2009, in the Afghanistan War (2001-) aircraft are launched and recovered from U.S. Air Force facilities in Afghanistan, but operationally controlled from Creech Air Force Base in Nevada in the continental United States. They are acknowledged to be flying in Afghanistan, and it is an open secret that they operate in Pakistan and possibly other nearby states, perhaps under Central Intelligence Agency operational control. Contractor: General Atomics Aeronautical Systems, Inc.
For direct viewing, it has an infrared sensor, a color/monochrome daylight TV and an image-intensified TV. These can be used separate video streams or fused with the IR sensor video. The Reaper has a combined laser rangefinder/laser designator. For JDAM, it uses synthetic aperture radar and GPS. Continuing upgrades include a signals intelligence package derived from the Airborne Signals Intelligence Platform (ASIP) series used on the U-2 Dragon Lady, MQ-1 Predator and MQ-4 Global Hawk. It will also have "a wide area airborne surveillance (WAAS) sensor developed by Sierra Nevada called Gorgon Stare, which can provide 12 different streams of full motion video simultaneously. " This page was last modified 21:36, 14 February 2011.